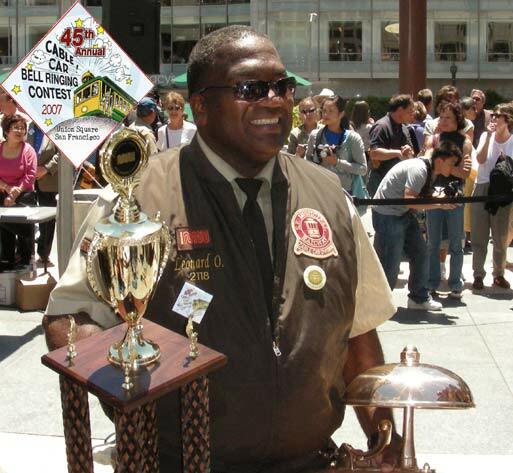 In May of 1949 a contest was held in Union Square to select San Francisco's best cable car bell-ringer. The winner, Cal Cable's Alexander Nielsen, along with two Muni gripmen were sponsored by Western Pacific Railroad to operate Powell car No. 524 (now No. 24) on a section of track at the Chicago Railroad Fair. 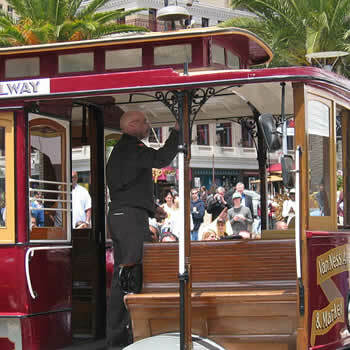 Just two years earlier San Francisco's cable car system was on the brink of being shut down by Mayor Lapham who wanted to replace them with buses. Friedel Klussmann's successful campaign to save them received national attention. Life magazine did a photo spread on the gripmen. They were celebrities in the spotlight - the last of a kind. Chicago's own cable car system had shut down in 1906. Their last running cars required police protection from mobs trying to strip off souvenirs. It wasn't until 1955 that another contest took place. In his 1954 election campaign, Mayor Elmer Robinson had promised a festival to promote cable cars as a visitor attraction. Ironically, he was also responsible for cutbacks in the service. 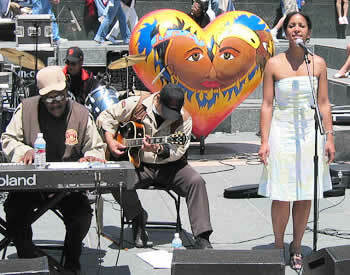 Traditionally held in July in Union Square, the contest has become an annual event that San Franciscans and visitors alike look forward to. 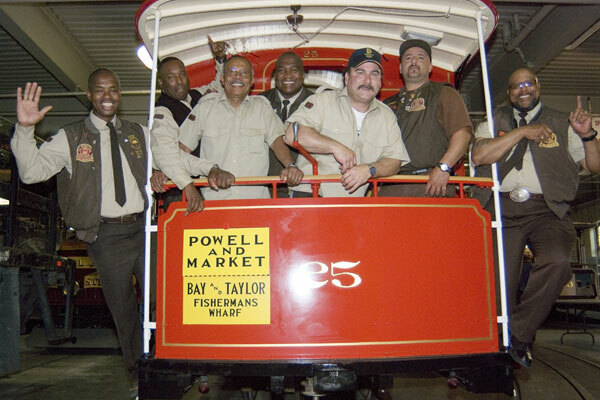 It's an opportunity to come out, have a good time and appreciate our unique historic cable cars and the crews that keep them (us) safe. 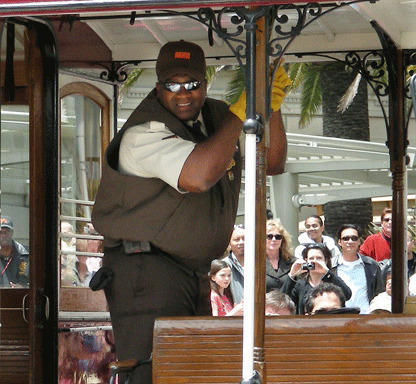 This year’s competition was limited to local media celebrities and unfortunately included no members from the Cable Car Division. 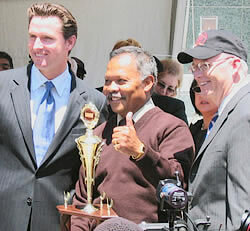 MTA chief Nathaniel Ford and Gilberto Godoy from the Cable Car Museum present the champ, Scotty Bastable, with his award. 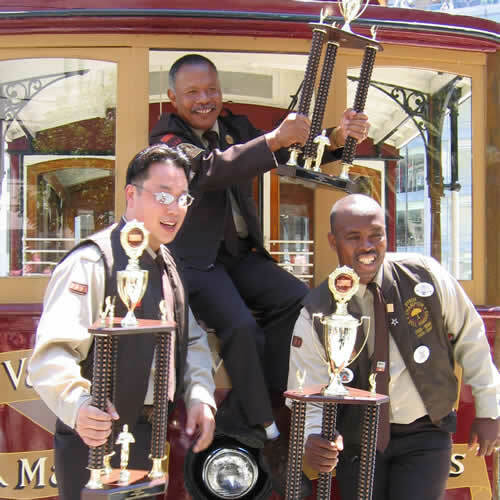 Frank Ware (2nd place), Howard Woo (3rd place) and the 2009 Bell-Ringing Champion is Leonard Oats! 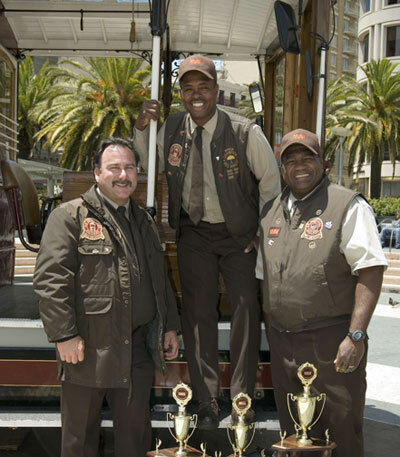 Ken Lunardi (2nd place), Byron Cobb (3rd place) and the 2008 Bell-Ringing Champion is Leonard Oats! Byron Cobb, Trini Whittaker, Frank Ware, Leonard Oats, Ken Lunardi, Thomas Leal and Patrick Ledbetter Sr.
Frank Ware (3rd place), Ken Lunardi (2nd place), and the 2007 Bell-Ringing Champion is Leonard Oats! Warren Robinson III (3rd place), Byron Cobb (2nd place), and the 2006 Bell-Ringing Champion is Ken Lunardi! The preliminary bell ringing contest was held June 28th at the Washinton-Mason cable car barn.The finalists will be competing atUnion Square. 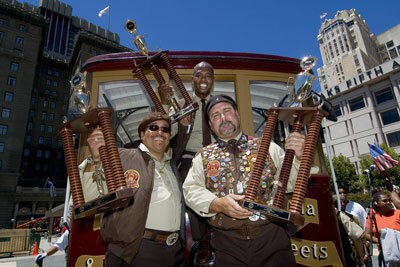 Howard Woo (3rd place), Frank Ware (2nd place), and the 2005 Bell-Ringing Champion is Byron Cobb! The preliminary bell ringing contest was held June 30th at the Washinton-Mason cable car barn.ÊThe finalists will be competing at Union Square. Ware had also been the first-place finisher in the 1999 contest. Scott was last year's champion, and had also placed second in 1997. Cobb has been a first-place finisher four times, in 1995, 1998, 2000, and 2001. 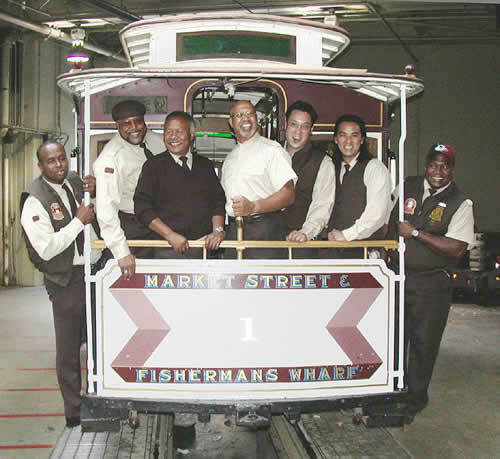 For both divisions of the contest, the first place winner received $1,000, and a cable car bell presented by the Friends of the Cable Car Museum, second place received $750, and third place received $500. There were also prizes of hotel stays, dinners, and other gift certificates, which were donated by the Union Square Association. 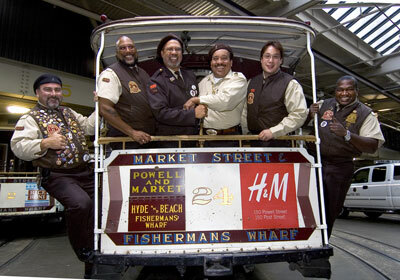 The MC for the event was Debi Durst, and musical entertainment was provided by the Cable Car Blues Band. 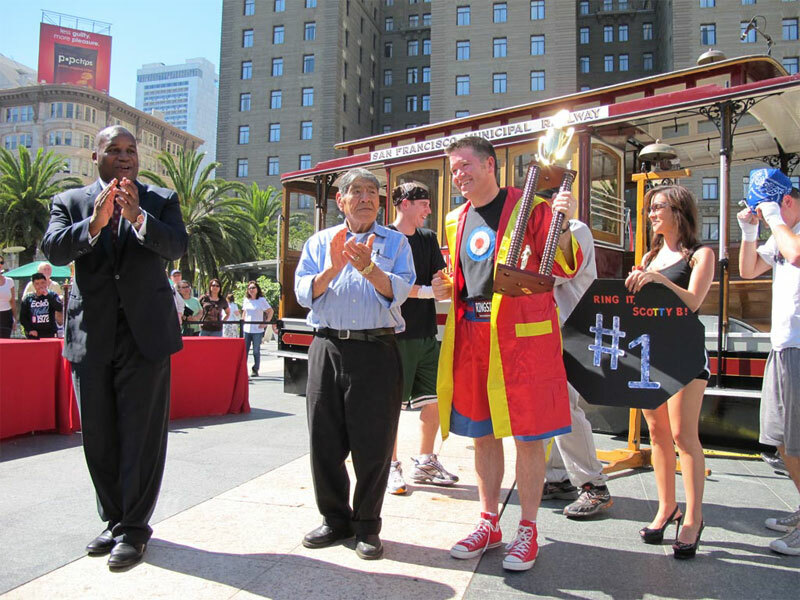 Muni's 42nd annual Cable Car Bell-Ringing Contest was sponsored by Muni, the Union Square Association, the Friends of the Cable Car Museum, and ING Financial.